Guests will be gathering at either Kabukicho Police Station or in front of Cocoon Tower at Shinjuku Station West Exit. We will then depart and take Chuo Expressway, with a break at Dangozaka SA before heading towards Arakurayama Sengen Park. This park in Yamanashi Prefecture is located halfway up to mountain nearby Lake Kawaguchi, and the view with sakura, Mt. Fuji and Five- story Pagoda is splendid during sakura blossom season. Over 600 Yoshino Cherry trees are grown in Arakurayama Sengen Park, joyfully embracing the red Pagoda around when flowers bloom in spring. 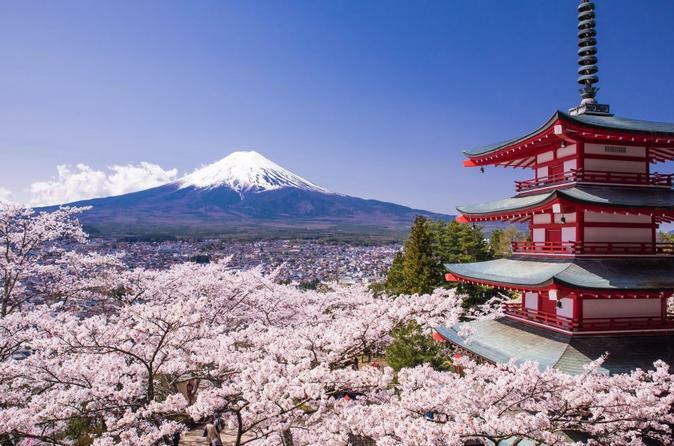 This can’t-miss spot has attracted quite many visitors, especially from neighboring countries in Asia, and certainly been a prime photo spot. It takes about 20 minutes’ moderate walk to reach Five- story Pagoda. Lunch will be served with Yamanashi’s local cuisine Hoto noodle set that has a rather long history of over 1000 years. This special tasty noodle is made of udon noodle and vegetable; vegetarian menu is available upon request. Afterwards it will be sakura viewing in Lake Kawaguchi Park. Magnificent Mt. Fuji can be seen from northern shore of Lake Kawaguchi, and constitutes a staggering picture with cherry blossom. Please enjoy while taking a cheerful stroll along the lakeside with about 1kilometer sakura trees.